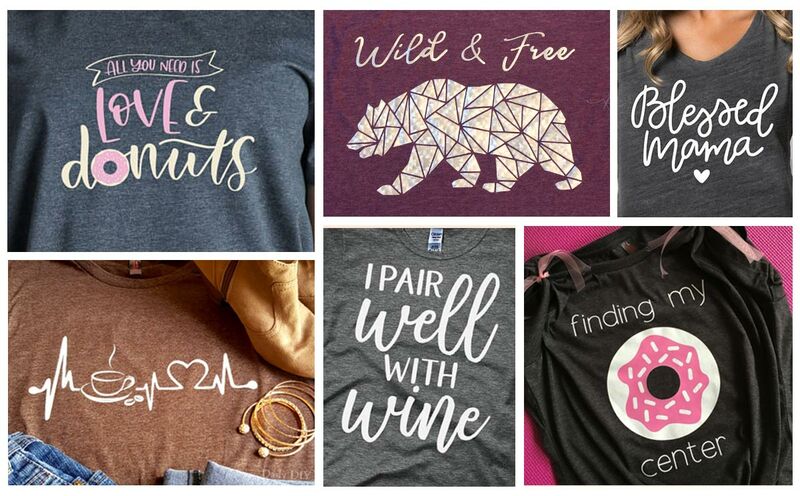 If you have an electronic cutting machine (such as a Silhouette or Cricut) and you haven’t used HTV (heat transfer vinyl) yet, you are missing out! Being able to decorate fabric (on items like t-shirts, aprons and tote bags) gives you so many possibilities. This spider web collar design is glitter HTV. It is amazing just how versatile it is! The big thing to keep in mind when working with HTV instead of regular vinyl is that you have to mirror your design since you are actually cutting out the WRONG side of the vinyl. But I personally think it is way easier than regular vinyl since you don’t need a transfer sheet to move the design. I’d rather work with HTV than regular vinyl any day. Once you get the hang of HTV you will never go back. And so today I want to share 25 Heat Transfer Vinyl T-Shirt Project ideas. Many of these projects actually have the cut files available so you can try them yourself. They are all part of the Craft and Create with Cricut Challenge. My entry was the “Wild & Free" Bear Tee. Here are the other entries into the challenge, make sure you stop by and grab the files so you can get started with HTV! It will be tons of fun.. I promise!